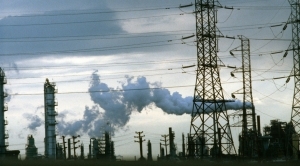 This warming trend, combined with pollution from cars, power plants and chemical plants, is expected to increase the number of days each year that New Jersey residents inhale unsafe levels of ozone pollution. 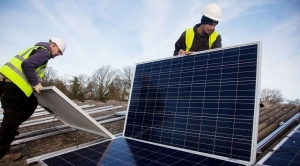 By enabling meteorologists to routinely inform their viewers about local generation of renewable electricity, the tool increases viewers’ awareness that low-carbon energy sources are already practical and increasingly widespread. 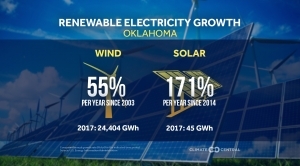 Renewable Electricity Growth Across the U.S.
See the gains wind and solar electricity generation have made in your state. 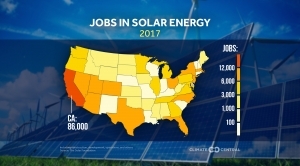 Wind and solar jobs are fueling the economy in these states. 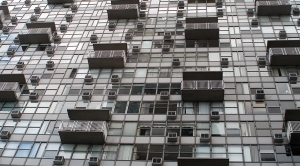 Air conditioning is becoming more vital as temperatures rise, pushing up utility bills and putting comfortable levels of cooling out of the reach of some. As additional carbon pollution continues to trap more and more heat in the atmosphere, the higher temperatures that result can come with a hefty price tag. 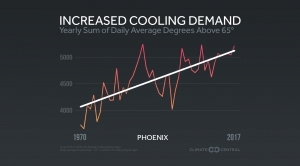 Cooling Demand is Increasing in the U.S.
Summers are getting hotter and this is coming with a cost — cooling demand. 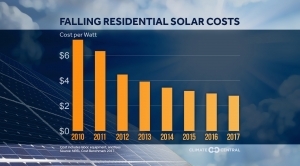 The cost of residential solar is dropping, now less than half of what is was in 2010.